Small streams are usually less crowded, challenging to fish and can often provide surprising results. Fly Fishers sometime pass up the opportunity to fish small streams for numerous reasons. They might believe that large migratory fish normally prefer larger rivers, or that fish are spookier and harder to catch, or that they can’t move up stream in shallow water. However, I have seen large salmon and steelhead move rapidly up a riffle on their sides that was barely three or four inches deep. Stalking fish in small streams requires a stealthy approach because fish can be easily spooked. But, if the angler wades quietly, wears drab clothing that blends into the environment and keeps a low profile, fish will not be alarmed. Learning to spot fish in shallow water can also be a very effective method. The first story took place when I was fishing a small tributary of the Clackamas River. It was not more than ten feet wide, and in most places it was at best three feet deep throughout the entire creek. I was fishing for trout using a small tied down caddis and had caught a few six- to eight-inch trout. I had the whole river to myself and was enjoying the solitude when I was suddenly shocked out of my euphoric state. I had made a delicate cast behind a moss covered rock when a five-pound steelhead took the fly aggressively and barreled down river. I tried to stumble after it, but the fish got the better of me and serrated my two-pound leader. This event generated my interest in fishing small streams. The next story happened on the Oregon Coast, which has many streams that can also provide some unexpected action. My friend Dave and I hiked in a quarter mile through tall brush and blackberries bushes to fish the Necanicum River, noted for steelhead and sea-run cutthroat. It was cluttered with log jams, thick brush and overhanging trees which closely guarded the streams pools, riffles, pocket water and gentle glides. A few nice cutthroat would have satisfied the day, but on my sixth cast the first pool provided some unexpected action. My line stopped and I instinctively lifted the rod and watched a large steelhead exploded out of the water. The fish began to make erratic surges and jumps as I strained to get it under control. Dave was filming and shouting instructions as I fought the fish. 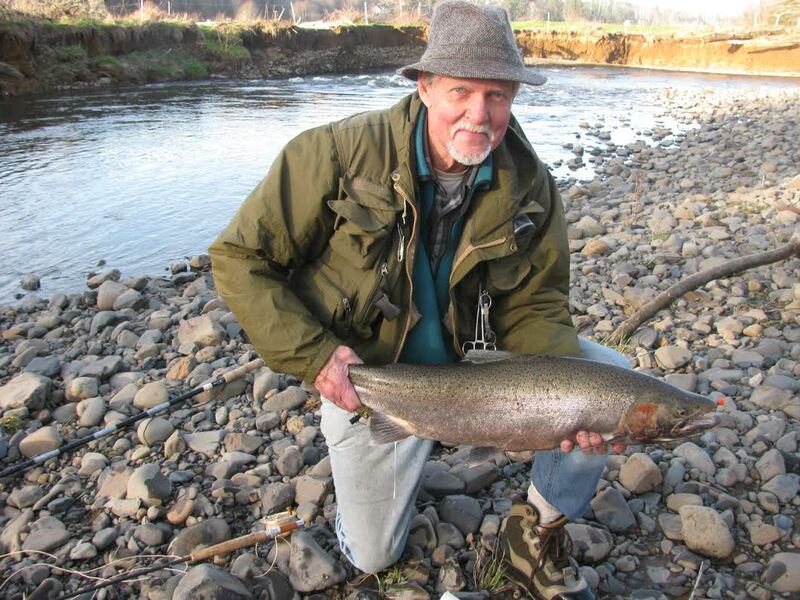 Fortunately, it stayed in the pool and after seven or eight minutes I landed a 12- to 14-pound hatchery steelhead. It took a # 6 orange Glo Bug.